We hope everyone liked the zombies last week. Today we're posting about something near and dear to our hearts, the visualization of opaque software processes made visible through exciting new technologies. Well, in this case, an exciting old technology known as folk dancing. Feast your eyes on the visualization of the "bubble sort" as interpreted through dance. Gives me all kinds of ideas for in class assignments this coming fall semester! And if you liked this sorting dance, be sure to check out the full range of "software sorting" made visible at http://www.youtube.com/user/AlgoRythmics. Thanks to Patrick Bigger who alerted us about this gem. Following our first post on understanding the coming zombie apocalypse, we thought it pertinent to pose, and attempt to answer, another set of questions using the collective wisdom of the geoweb. While our earlier post sought to understand the spatial dynamics of the zombie apocalypse by finding where there were relative concentrations of references to "zombies" and "old people", we all know that a healthy supply of food is an important factor to consider when staking out places to hide from zombies. We all know that zombies eat human brains. It's almost so widely accepted that I just wasted 15 seconds typing these two sentences. 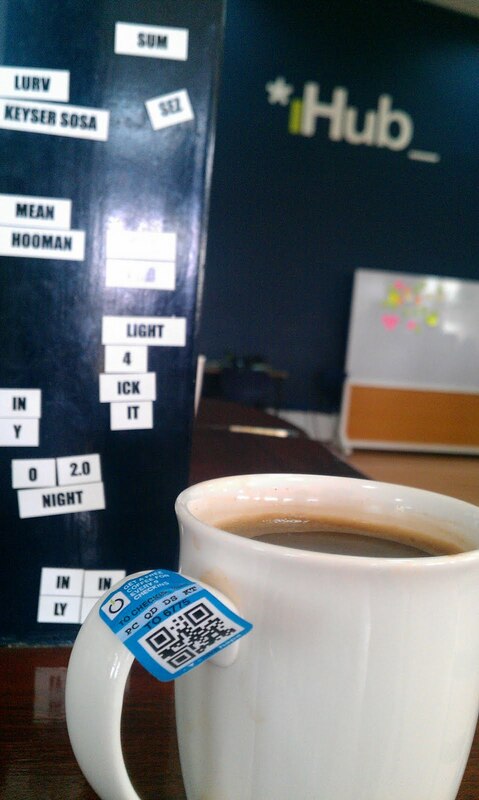 So what is the opposite of the human brain? The exact thing that zombies would not, under any circumstances, have any interest in consuming? The answer: salad. Why on earth would zombies want to eat salad? It makes no sense. Presuming this fact to be true, we can measure the relative concentrations of references to "brains" and "salads" in order to know where might be good places to avoid, and where might be good places to hide out in the case of the zombie apocalypse. Or, in a less dire scenario, where there might be lots of vegetarian restaurants to eat at next weekend. 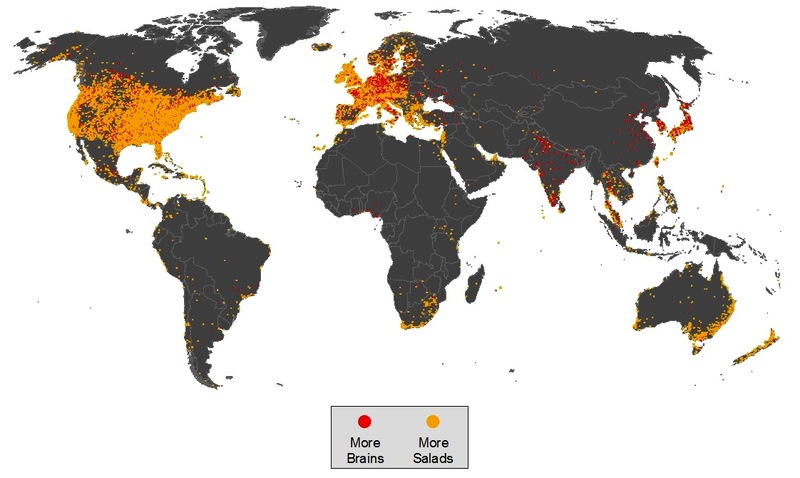 At the global scale, the distribution of brains and salads appears to heavily favor salads. This is especially good news for most of the United States, South Africa, Australia and New Zealand, and some pockets of Europe. Japan and China, however, appear to have much higher concentrations of brains, making them ripe for future zombie attacks. Who knew that all of that focus on education could end up being a bad thing? However, because continental Europe displays such variability, it is important to take a closer look at how brains and salads are distributed. There appear to be a few patterns worth mentioning. First, coastal areas appear to be more secure given the prevalence of salads in coastal areas across most of Europe. While there is no clear cause for this, it seems plausible that it could be because coastal areas present more opportunity for fleeing from zombies, since water poses a considerable obstacle to the undead. Second, there appears to be a clustering of brains in the Normandy region of France and in parts of Germany. While this contradicts our earlier finding that France and Germany are seemingly safe from the zombie apocalypse given the large number of old people, perhaps our shot in the dark about zombies masking their presence in these places was more founded in evidence than we suspected. Probably best to avoid anyone over the age of 25, just to be safe. 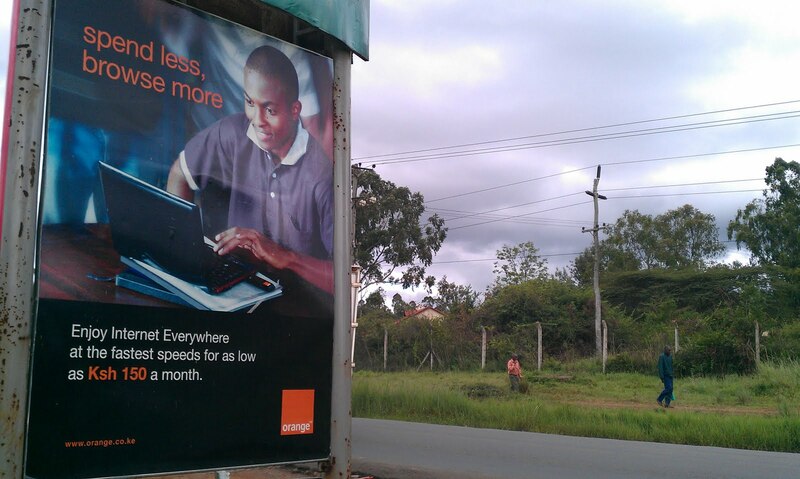 Given the smattering of brains across the continent, it appears that no place is entirely safe from the zombies. It's also worth noting that just because there are more salads than brains in a location does not mean there are no brains worth consuming. Just because zombies don't receive as much payoff in these areas doesn't mean they can't make their way there should all other tasty cerebral resources be exhausted. With all the recent talk of the zombie apocalypse, including our own forthcoming book chapter on a similar topic, we've been worried that the older and slightly disheveled population has been put at greater risk of personal injury due to their being confused for the undead . Always eager to lend a helping hand, the Floatingsheep collective has turned to the infinite wisdom of the collective internet to map the relative prevalence of zombies and old people. It is our hope that this guide will help lower the level of zombie hunter on senior citizen violence that has plagued human kind for generations . 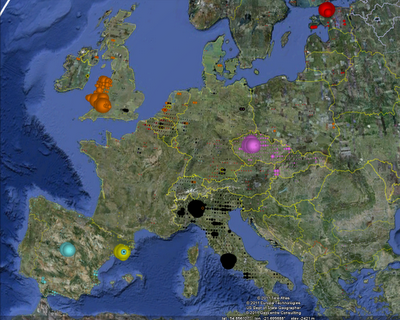 Europe, for example, presents a quite clear picture of the spatial variation in the zombie and elderly populations. Word to the wise for our transatlantic zombie-hunting compatriots: hold your fire in France and Germany. Though we have no idea why there are so many old people, do make note that these are innocent citizens. Unless, however, the zombies have established a colony in these countries and have just effectively been able to hide their presence under the guise of retirement homes . Do, however, be on the lookout in the low countries, as zombies appear to be rampant in the Netherlands as well as much of Belgium . When looking only at the United States, however, there is no such easily discernible spatial pattern. 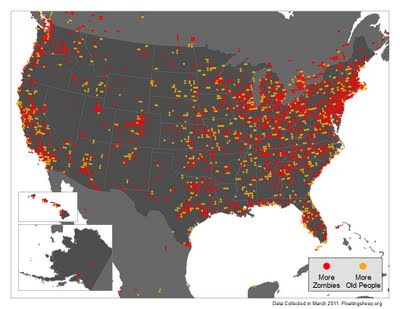 Though much of the eastern seaboard appears to be dominated by zombies, this corpse cluster is bookended by small concentrations of the merely elderly in both Washington, D.C. and Cape Cod, Massachusetts. Given our earlier finding of Cape Cod as being the highest concentration of "fun" in the United States, we're not sure if this should be surprising. While many may not consider shuffleboard and iced tea to be the most fun things in the world, I believe we can find some general agreement on the fact that a zombie apocalypse is most certainly NOT fun. If it is a choice between spending a weekend with the undead or the old-fashioned, I think we're all going to pick grandma and grandpa. Ultimately it appears as if zombie hunters in the United States will be forced to use their best judgment, rather than the tools of spatial visualization, to determine who needs to be taken out in the event of the zombie apocalypse. No senior citizens were harmed in the making of this crass, terrible attempt at humor. Plus it was Mark's idea. We also thought "confused people" might be mistaken for zombies as well but despite our expectations -- and considerable evidence all around us in the material world -- searches for for references to the phrase "confused people" in the geoweb did not produce many results. The lack of cognitive abilities on the part of zombies does make this theory somewhat less plausible. But when you're talking about the zombie apocalypse, you can never be too careful. Or, perhaps if we had also done a search on "stoned people", the pattern would be different. Mark is currently hiring a 28 month Research Assistant (or Postdoctoral Research Fellow) to work on an ESRC-DFID funded project titled "The Promises of Fibre-Optic Broadband: A Pipeline for Economic Development in East Africa." Full job details and online application are available at this link. Salary £25,751 - £30,747 p.a. Mark recently received two awards to study participation, voice and representation in Wikipedia in East Africa and MENA (Middle East North Africa). The funders are the IDRC and the Fell Fund. 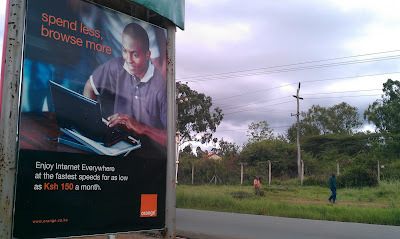 He also received an award to study changes brought about by new Internet connectivity in Kenya and Rwanda. This project is funded by an ESRC-DFID joint award. Preliminary research was funded by the British Academy and the Fell Fund. He is also hiring a 28 month research assistant or postdoc to be based in Oxford and/or East Africa, and would encourage anyone with experience and interest in this area to apply. Finally, he received a grant from the Royal Geographic Society to present a paper on Africa's 'Silicon Savannah' at the Third Global Conference on Economic Geography in Seoul, South Korea. After (finally) finishing his M.A. thesis on university research parks and urban development in Lexington, Taylor will be leaving Kentucky in August to join the Ph.D. program at the Graduate School of Geography at Clark University in Worcester, MA. This is all part of the FloatingSheep collective's master plan to colonize the discipline of Geography. Baa.....! Monica was accepted to the Vespucci Institute for Volunteered Geographic Information in Fiesole, Italy that took place from June 6th to 10th. Her group won the first Peter A. Burrough Award for their project on MyPLACE (People, Location And Community Empowerment). Funding for her travel expenses to the Vespucci Institute were provided by the IGERT program at the University of Buffalo. In addition, Monica's Methodologies in Cyber-Cartography paper was accepted to the International Cartographic Conference in Paris, France. Travel award from the U.S. National Committee to the International Cartographic Association. She was awarded a travel grant from the Graduate and Professional Student Council from the University of Arizona and received additional travel funding from the School of Geography and Development at the University of Arizona. Matt was invited to participate in a Panel on IT/social media and disaster resilience for a meeting of The National Academies Committee on Increasing National Resilience to Hazards and Disasters Meeting in Irvine, CA at the end of May. He will also be presenting at the Third Global Conference on Economic Geography in Seoul, South Korea at the end of June. Continuing our look at the distribution of language in the geoweb, the map below shows the pattern of references to the word food in Arabic and Hebrew. The locations marked in gray are places in which neither language had more references which usually meant both languages had zero. Locations in white are either indicative of water (e.g., the Black Sea) or are places without any placemark references. The dominance of Hebrew in the Israel/Palestine area corresponds to some of our earlier findings. Continental Europe shows some interesting clusters with much of Italy, Belgium, the Netherlands and parts of Germany contain more Arabic references, while Switzerland, Austria and parts of Germany have more references to food in Hebrew. With the summer months upon us, the FloatingSheep Collective is busy with travel and paper-writing and as a result, we've not been posting as much. This will be changing over the next weeks as we are working on topics ranging from zombies to augmented reality to marijuana pricing to the interaction between material and virtual flows in the economy. We'll be pushing some of this material out later in June and July. We searched for the term "beer" in about 70 different languages -- some native to Europe, others from around the world -- to see what kind of patterns we could see. The map below shows the distribution of six languages that we selected to highlight the tight ties between online use of language and offline patterns. The clustering of references corresponds very closely with the distribution of the speakers of each language, even languages that exist within a state with another dominant language. For example, Welsh appears within Wales but in few other places within the United Kingdom and Catalan is concentrated around Barcelona within Spain. The other interesting finding is that most languages have a micro-cluster of references to beer within Brussels. Whether this is due to the high quality of Belgian beer or the fact that the E.U. is headquartered there remains to be seen. Note: The size of the circles are consistent within a language but should not be compared between languages. 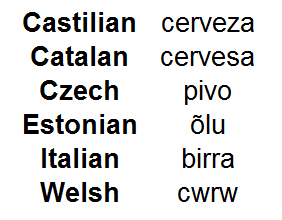 For example, there are many fewer references to beer (or anything) in Welsh than in Italian. There's a great new book out by "friends of the sheep", Rob Kitchin and Martin Dodge. 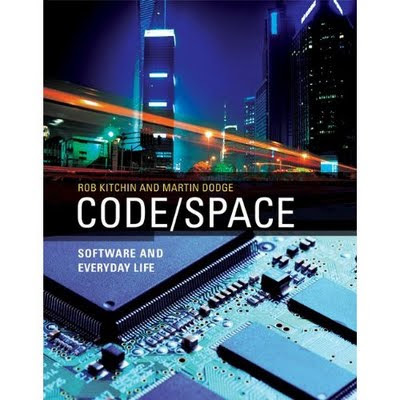 It focuses on the interaction of software with everyday life and includes chapters on airports, road networks, and the home. I highly recommend this book to anyone who is interested in the ways in which code is shaping our world. You can check out a teaser portion of the book (including the first chapter) or just go ahead and order it from Amazon.